After the devastating Victorian Black Saturday bushfires in Feb 2009, the construction industry has attempted to create fire proof housing. The latest home to be put to the test is a steel frame house, built with straw and clad with ModakBoard. 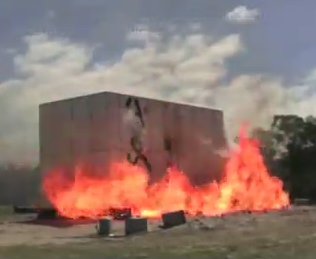 The home, designed by architect Joost Bakker, was subjected to a worst case scenario bushfire simulation, where it withstood a raging wall of flame for nearly 2 minutes. The test was conducted by the CSIRO Bushfire Urban Design Research team led by Justin Leonard, in Mogo, NSW. The result? Not only was the structure still standing, but it was completely intact! Watch the following videos for the full story.